In Bring on the box sets, we highlighted the fast-growing area of activity called unmatched viewing, which includes viewing more than 28 days after linear broadcast and non-broadcast viewing. Viewing to subscription video-on-demand (SVOD) services like Netflix and Amazon is part of unmatched viewing and is likely a significant contributor to this growth. Unmatched viewing accounted for 16.4% of all TV set activity in 2017 and continues to grow. For example, during the spell of snowy weather this March, total TV viewing (live and seven-day catch-up) increased by 8.4% year-on-year in the week ending 4th March 2018. However, total screen time increased by 14.8% during this time. This led to unmatched content accounting for 19.5% of TV set usage. For under 25s, unmatched content accounted for nearly 43% of TV set usage in that week. While we aren’t yet able to measure actual viewing to SVOD services without the cooperation of the service providers, we can get a sense of the popularity of these services from our Establishment Survey, which has been asking questions about SVOD service take-up since 2014. The SVOD market is enjoying a sustained period of growth in the UK; the number of households that subscribe to at least one SVOD service surpassed 10 million in Q4 2017, a 23% increase on Q4 2016. When you take into account homes that have more than one service, we can project that there are at least 14 million subscriptions to SVOD services. This is in addition to any pay-TV packages to which homes are committed; indeed, our data show that there is significant overlap between households that choose to pay for television and those that also choose to pay for SVOD services. Many households subscribe to both to get access to all of the content they want. We can also compare the SVOD services by their total annual subscription growth. Netflix, still the dominant SVOD player in the UK, grew at the slowest rate of the three main services, with a 25% annual growth rate, but added the most subscribers in the year, rising by 1.6 million to a total of 8.2 million households. Amazon and Now TV were neck-and-neck in their annual subscription growth. 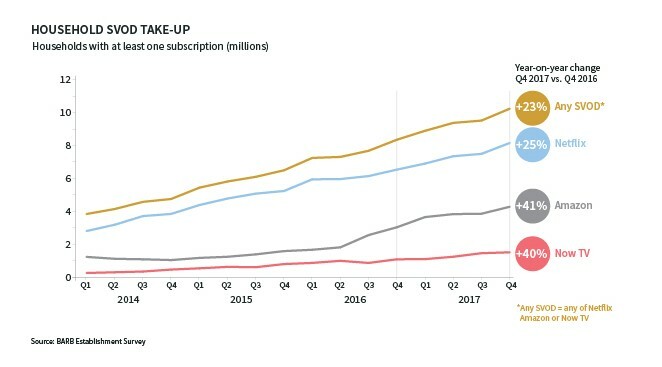 Amazon grew 41%, adding 1.3 million subscribers to reach a subscription base of 4.3 million households, while Now TV grew by 40%, adding 0.4 million subscribers to reach a base of 1.5 million households. 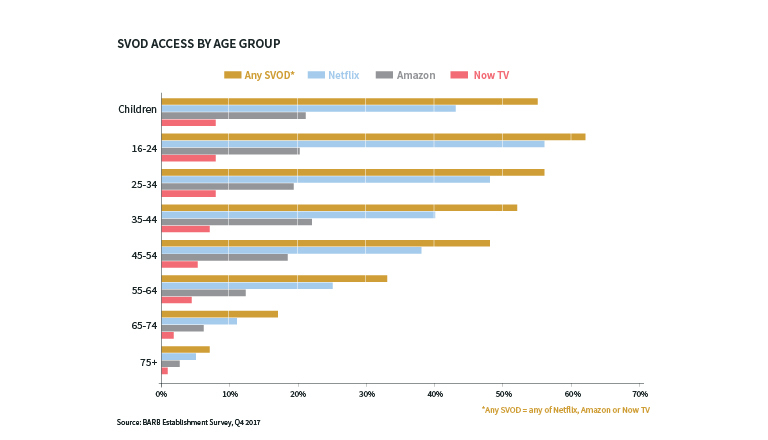 Looking at SVOD access by age group, 55% of all children in the UK have access to one of the SVOD services. For young adults aged 16-24, 62% have access to one of the SVOD services, while the figure is 56% and 52% for 25-34s and 35-44s respectively. Deloitte’s Mobile Consumer Survey indicates that the behaviour of young people is replicated by all ages five to eight years later (see Ed Shedd’s guest article, pages 10-11), so SVOD access by older groups is likely to increase over this time too. With SVOD services in 36% of UK households and continuing to grow, it’s clear that SVOD isn’t a new entrant or optional; it is a staple service. Far from being niche, SVOD services are now an established part of the television ecosystem. Read BARB’s recent SVOD report, featuring further analysis of SVOD access in the UK, here. To see the latest data on SVOD household subscriptions, check out our tracker.